If you live in a town home or newly constructed home in Seattle, chances are you have a small backyard. If this is the case, big old shrubs like Butterfly Bush and Mock Orange simply won't fit. A traditional cherry tree will overshadow the entire area, turning your garden into a dark, muddy pit. So what should you plant if you have a 15-foot by 20-foot yard? If you have only a patio with a brief border around it? There are many dwarf and narrow versions of trees and shrubs that homeowners can use to create an interesting, colorful garden. Here are some of my favorites. Liquidambar styraciflua 'Slender Silhouette.' Liquidambars or Sweetgums are notoriously tough. Planted on street medians and in shopping centers, they can take drought and pollution. Plus, they have red and yellow fall color. When I discovered this tree, I was excited. It's a fastigiate or columnar form, rising to 35 feet tall but widening only to 4 feet. Usually Sweetgums drop little balls of fruit, but this tree's aren't as messy. Also, their spiky, palmate leaves are cool in that they're maple-like but not quite a maple, almost like a Goth maple, and add interest to the border. If you've got a cell tower or electricity pole you want to screen, this would be a good choice. Chamaecyparis lawsoniana 'Blue Surprise.' When I design a yard, I incorporate foliage color. 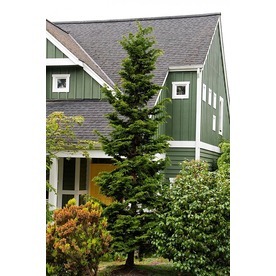 And for a truly blue evergreen conifer, Blue Surprise Port Orford Cedar can't be beat. A few junipers boast a blue color but this cedar is coldly blue with starry needles that give it a fluffy texture. The official word on these evergreens is they grow 6 feet tall but I have a couple in clients' yards that, after 10 years in full sun, are 8 feet tall. The good news is they widen to 2 feet max. Plus, they contrast well with a deep green Choisya ternata or purple Heuchera 'Plum Pudding' or the red stems of Drimys lanceolata. Beautiful on either side of a house entrance. Acer palmatum 'Shishigashira.' Say that three times fast! I'd be remiss if I didn't include at least one Japanese Maple in a post about plants for small gardens. 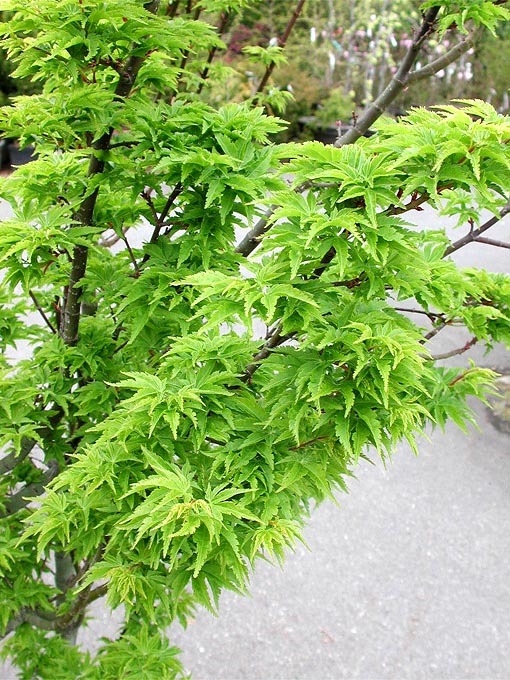 'Shishigashira' or Lion's Head Japanese Maple has highly palmate, highly pointed leaves that curl downward as they grow in vertical clusters. In fall, the tree turns yellow with patches of reddish-orange. Grows to about 12 feet high by 4-5 feet wide. This combination of vertical leaf clusters and curved leaves creates an unusual, sculptural form that's a real conversation starter. Chamaecyparis obtusa 'Gracilis.' Slender Hinoki False Cypress grows in a slow, behaved pyramidal form. It's one of those conifers people overlook as it's used often, but when you really examine it, its beauty is unmatched. Its trunk is straight, almost artificial looking, with horizontal fans of foliage that are forest green on top, lighter underneath. This gives the tree a two-toned look as the fans cascade down in a graceful, perfectly spaced manner. 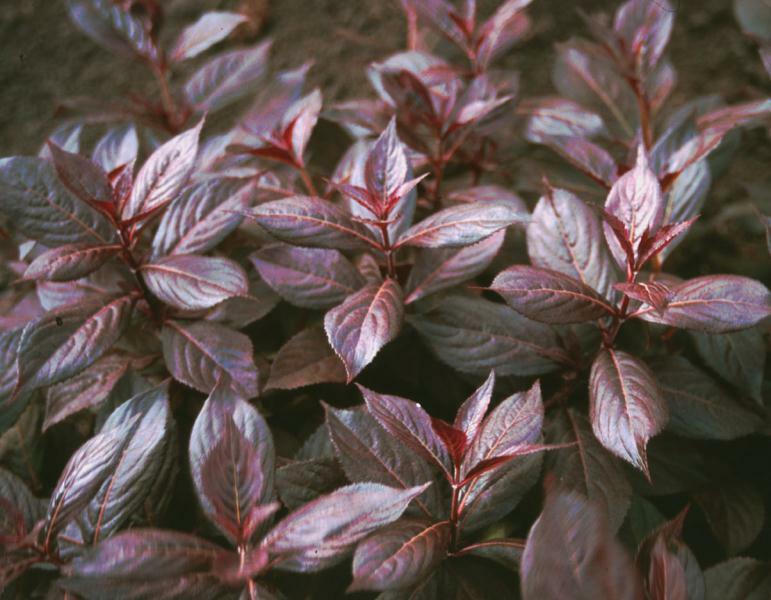 It grows to about 15 feet tall by 4 feet wide in sun, partial-shade, or shade. I've found the sweet spot for it is partial-shade. Magnolia grandiflora 'Little Gem' or if not available, 'Baby Grand.' Both are small, broadleaf, evergreen trees. 'Little Gem' grows in a narrower form, and taller to about 20 feet, while 'Baby Grand' has a more oval crown and grows to about 12 feet. Either one gives welcomed glossy greenery during winter. 'Baby Grand' has slightly wider, darker green leaves but 'Little Gem' features tan felt on its undersides, thus adding interest. Both bloom in large, cream flowers that smell lemony fresh. Exquisite. Physocarpus opufolius 'Little Devil.' This dwarf ninebark has spectacularly dark purple foliage that contrasts nicely with its white, flat-headed flowers. It's a tough-as-nails plant, preferring full sun. I've planted a couple in partial sun and they've done just fine though the purple has faded to a greenish blue. 'Little Devil' offers the easy care, no-pruning-needed, disease-free benefits of a ninebark without it taking over your yard. Plus, in winter it sports peeling, tan bark. These grow about 4 feet wide and tall. Deciduous. Cistus x pulverulentus 'Sunset' (Rockrose). You need a hotspot for this evergreen shrub, but if planted in a sunny place, it will reward you with magenta flowers and a spicy fragrance. 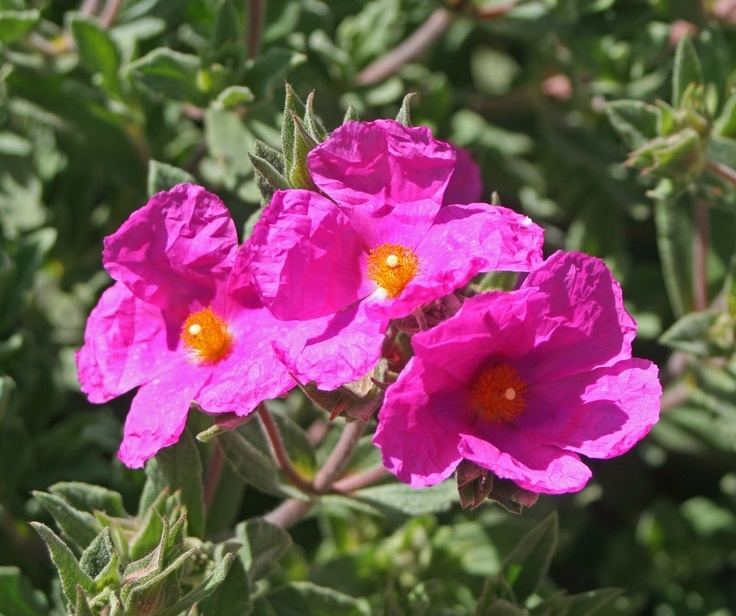 Also, unlike its cousin Cistus x purpureus, this shrub only grows to about 2 feet high and 4 feet wide, and 'Sunset' has wider, feltier leaves that make a heftier statement visually. The old leaves need to be raked out occasionally but for the most part, this plant is carefree. If you prune into brown wood, that branch will not recover. It's like lavender that way. But if you don't touch it, it will just gently put on sea-green growth and stay a rounded shape. I like to plant 'Sunset' near Hebe 'Amy' for a green/purple foliage contrast and pink/blue flower contrast. Spiraea japonica 'Magic Carpet.' Here's a compact, deciduous shrub whose leaves emerge in a vivid gold with orangey new growth. It even has a touch of red at the tips. As spring progresses, the foliage fades to chartreuse and blooms in bright pink umbels. It grows in a tight, mounding form, about 2 feet wide by 2 feet high, smaller than its relative 'Goldflame.' In the Northwest, plant it in full sun and it will need little care save for yearly deadheading and an occasional light pruning for stray branches. Hebe 'Silver Dollar.' There is a multitude of hebes in the world, and I love most of them, but some are hardier and more reliable in Seattle's climate than others. 'Silver Dollar' is a compact, evergreen shrub with variegated gray-green, waxy foliage dusted by pink hues in winter and spring. This gives it a variegated tone before the pink color fades. Later, in June it blooms in blueish white spikes that bees love. Hebes need good drainage but if given that and planted in half to full-day sun, they require little attention. I like them as a boxwood substitute. 'Silver Dollar' matures to 2 feet tall by 2 feet wide. Editor's Note: Availability of these trees and shrubs may vary. If you are interested, please check with us about specific availability! Karen Hugg is the owner of Red Madrona Gardens, a small garden design and maintenance company. She also writes about gardening on her blog, Gardening, Seattle Style.